PhotoModeler is the ultimate survey tool when bringing bulky equipment into rugged field conditions isn’t an option. When you need higher accuracy in your point clouds than your laser scanner can provide, PhotoModeler Scanner is your solution. PhotoModeler is the most versatile tool available for a surveyor’s toolbox, capable of generating results as a standalone application, or for combining with data sets from other devices for control and alignment of your critical survey projects. 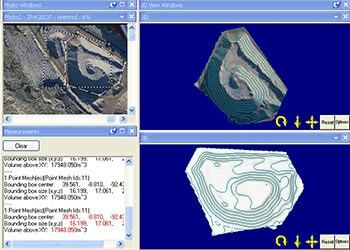 PhotoModeler can be used to create accurate line drawings, DEMs, and orthophotos. 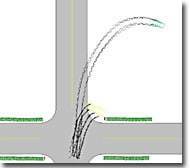 Input coordinates are accepted from other surveying equipment and outputs can be georeferenced. These quarry and stockpile shots were done with a Canon EOS 1DS mark II and 50mm Leica lens from a Cesna 172 aeroplane at approx. 300 meters. The screen shot shows the stockpile's contours (on top of both shaded and textured models), as well as the volume above the ground plane in the software's Measure window. This project was created by Sitag S.L. in Spain. The project displays the industrial modeling and measurement capabilities of PhotoModeler. The subject is an electrical station. PhotoModeler is used to model the station structure as well as electrical towers and lines. 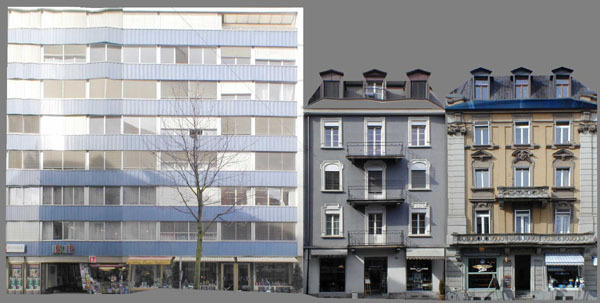 This 3D model of Lucerne's historic town center was created for use on a website to enable potential visitors to experience a realistic on-line tour. The tour provides a much better perspective of the area than can be obtained with a simple map. The revenue for the site is provided by merchants who pay to have their stores featured as part of the model. The 50 buildings included in the model meant this would have been a time consuming and very expensive process using traditional surveying methods. PhotoModeler provided a more efficient means of creating an accurate and visually realistic model from about 500 photos, at a fraction of the cost. Surveying is often done at accident and larger crime scenes. Here an incident between a GMC pickup and a Saturn at a rural intersection was documented with photographs from a police-owned camera and evidence markers. Not only was a scene diagram created, but an orthophoto was used to check tire mark shape, and some crush measurement was done at the scene (again using PhotoModeler). The photograph shows the scene with the pickup truck in the foreground with skid marks, and the Saturn sedan in the far background on the field. A 2D diagram (Courtesy of DCM Technical Services) was created in CrashZone from the data exported from PhotoModeler. 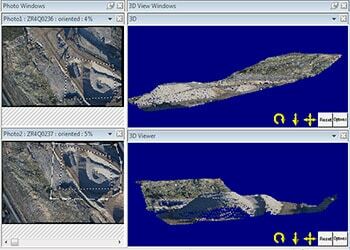 PhotoModeler is a full 3D package but can easily export data projected on a plane for 2D mapping. An orthophoto of part of the road surface was generated showing the skid marks. One cannot get the true shape of the skid mark in a photograph taken at ground level due to perspective distortion. 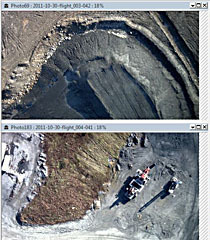 The rectification and orthophoto function of PhotoModeler creates an output image that removes the perspective distortion - as if the photograph was taken from in the air over the road. The true shape of the skids can be studied in such an image. The 3D view of the 2D diagram in CrashZone is suitable for court and jury presentation, as some may find it easier to understand.